The latest WordPress upgrade broke my site. Your site is powered by WordPress. Thus, the WordPress upgrade broke your site. I’m likely preaching to the choir with this post given the audience (at least of which I’m aware), but in case anyone reads this is not a WordPress developer and is someone who is tech-savvy and tries to say on the up-and-up with WordPress, then perhaps it’ll be useful. If nothing else, I can reference this for others with whom I work as a means to explain something without doing so over and over again (and hopefully in a much clearer way). Just because you upgrade WordPress and your site breaks does not mean that the WordPress upgrade broke your site. This sounds a bit like circular reasoning, doesn’t it? Bear with me. 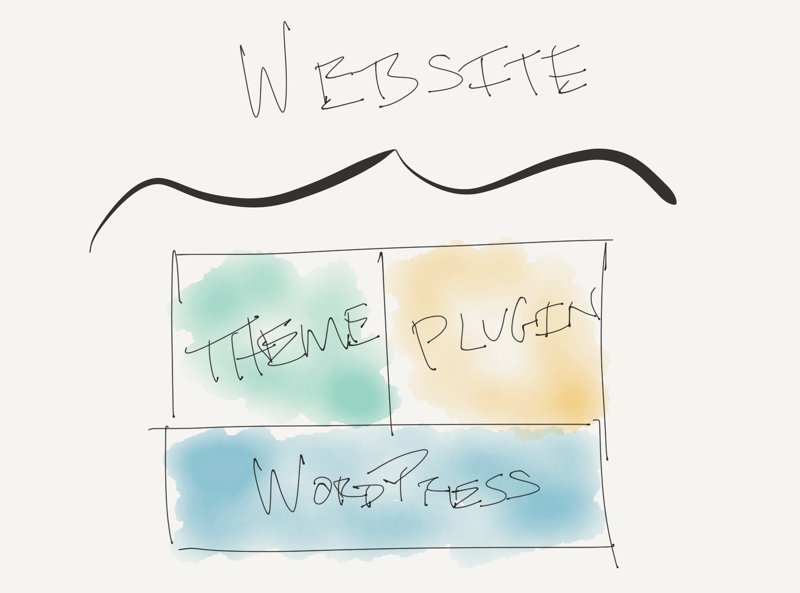 How to conceptualize a WordPress site. And now matter how simple or complex your site is, these three things do exist. For example, if you’re running WordPress out-of-the-box, then you likely have the default theme and a plugin such as Akismet. If, on the other hand, you have something more complex, then you likely have a more involved theme with a handful of plugins each of which are extending functionality of your site that’s not available outside of the box. How is it that when we don’t change our themes and we don’t change our plugins, but we change WordPress, the core software isn’t the culprit? To answer that, it’s worth taking a look at how it all fits together. Remember themes are part of your website that give it its presentation – the look and feel. It’s like the make up and clothes sitting over your content to make it look good to your users. You can stick with what you’ve always had, you can introduce something new, or you can go on and change it to something completely different. But where you get your themes matter and whether or not they are compatible with the latest version of WordPress matters. If you use a theme from a source that’s not reputable, and/or if you use a theme that has not been updated in sometime, you are running the risk of compromising how your site functions. It’s not because WordPress broke your site, it’s because the theme doesn’t work well with the current version of WordPress. The blame then lies not with WordPress, but with the theme. As themes give a look and feel to your site, plugins extend functionality such that you’re able to do something with your site you’re not able to do out of the box with a standard WordPress installation. Working with a variety of plugins can be a great experience or it can be an exercise in frustration. If the plugins follow the WordPress Coding Standards and don’t do anything that’s outside the scope of what a plugin should do (in terms of interacting with the database in odd ways or not doing proper checks for certain constants, functions, class names or variables), then it should be fine. There are plugin developers who build their work in what they conceptualize as a “closed-system” though I doubt that’s how they’d describe it. That is, if their plugin works on its own in a basic installation of WordPress, then it’s good to go. But that’s not always the case. And when it’s not and when it’s not properly updated for the latest version of WordPress, then there’s a chance it will break your site. Just as with themes, it’s not WordPress that broke your site, it’s the lack of development on behalf of the plugin authors. For those who are building themes and/or plugins, how do we know we should be making sure our projects work with the latest version of WordPress? And that’s our cue to begin testing our plugins and preparing them for the next release of WordPress. And you know what? I’ll be one of the first to admit that I don’t always have my plugins updated on time but I will say that I make sure, from the outset, that my plugins are following the standards as best as possible. Further, I answer every single email that comes in regarding my plugins. I always try to keep my plugins as compatible as possible, but there are times where other priorities are in the lead. The odds of it being WordPress is actually pretty low. This doesn’t mean it’s never the cause, but I’d make the case it’s far more likely it’s a theme, a plugin, a set of plugins, or a combination of them working with each other that doesn’t work well with the core software. And when that’s the situation, then it’s usually going to be at least one of the things – the theme, one of the plugins, or multiple plugins. The next time you upgrade WordPress, remember to review your theme and your plugins. Change to the default theme, disable the plugins, and then enable them one by one until to see if something isn’t performing correctly. As soon as something breaks, you’ve likely found the culprit. Sure, it’s time consuming and sure it’s tedious. But this is your place on the web. It deserves a bit of attention and care. The upgrade process is about as simple as it could possibly be, right? Why not spend a little bit of time that we’ve saved with those upgrades making sure the things that are tailored to our site continue to do so rather than jumping to a hasty conclusion? Now we just have to teach all the WordPress developers upgrading their OSX and/or IOS devices on the software release date that this also applies to Apple products too. And sometimes it doesn’t. So true. I can’t tell you the number of times I’ve had to tell people this after they update their site but not their plugins and wonder what went wrong. Luckily it’s usually an easy fix. It’s easy to say we have our work cut out for us in terms of what should be done, but the problem is that it’s far easier to say than it is to actually do. It’s the whole “In theory there is no difference between theory and practice. In practice there is.” thing. Good stuff, and – even as someone who’s as technically aware as a Star Wars battle droid – it’s something I smile at when I see it happening. I’ve upgraded before, and found some snafus – but it’s always turned out to be an older plugin. Or even a host that’s not running optimal PHP. The worst ones are the themes where plugins are specific to that theme or developer, and then they cause the issue. I’ve been guilty of jumping the blame gun before (and no doubt will again), but I’m trying to be better at identifying where the blame lies. We all should do a better job of that. It isn’t the new WordPress releases but the lack of good documentation when the lead developers make changes. This first happened when WP 4.0 Cookie Authentication changed in beta 2. This caused all kinds of headaches. It’s still unresolved – because caching no longer works when my plugin is used. I see bridge workaround where there is basically removal of important security requirements. In WP 4.4, the get_avatar was changed. This means my current plugin replacing get_avatar failed. It’s taken hours for me to figure out how to proceed. The latest attempt is to use add_filter (”, ‘name of function’); instead of replacing. But not everything is working. Again — no documentation on how to proceed by the lead WP developers. I’m not sour – so please don’t take this comment wrong. It’s not easy developing and documenting. But WP development documentation is incomplete — and IMO gets worse with each release. I understand, though. Good documentation isn’t easy to write. I think this is a fair point, although I don’t have any really “big” plugins. Most of mine are small utility plugins that are meant to help augment publishing in some way. I think the Make blogs are pretty good places to follow for development, but I won’t pretend that there is lack of documentation and it can be a hurdle. When all else fails, I end up having to just pour through the source code to make sure I understand if something is working the way I think it is working. I’m not sour – so please don’t take this comment wrong. No way, I’m not taking it wrong. I think it’s a balanced look at the struggles faced in something like this :). But WP development documentation is incomplete — and IMO gets worse with each release. I understand, though. Good documentation isn’t easy to write. It’s not, but that’s not an excuse, you know? The thing is, we have more people actively doing development than we have actively writing documentation. It leaves something to be desired, for sure. I don’t know if such quick releases are a good thing or not (though I generally favor them), and I don’t know if there needs to be a new time writing documentation based on an outline provided by core developers or not. I don’t have any suggestions right now. I do think, though, that what you’ve mentioned are valid points (and raised respectfully, too. This is something we don’t always see in WordPress, but I digress.). As an end user (not a developer) i have to appreciate LPH’s comment more than anything else. If WP decide to make a new release, and it’s a major release which may contain major code changes, it’s up to WP to ensure that it provides theme and plugin developers with sufficient time to adapt their products to the new WP release. Not providing developers with sufficient time before releasing a new WP update, means that any changes which break a site are the fault of WP. In the authors article, he shows an update imminent notice from WP, giving 10 days notice. After the latest farce which erupted with Clifford release, it’s obvious, even to me, that 10 days not sufficient time for every developer. This insufficient time impacts me as an end user of WP. So, still, in my opinion, it’s still totally WP’s fault. Can you imagine if Sony released an upgrade for the PS4 system without providing game publishers with sufficient time? and if we had PS4 games “breaking” all over the place all of the time? Or if G Play or Apple updated it’s store system resulting in thousands of broken downloads? Or if Windows updates constantly broke apps and programs? If you create a monster, you have to ensure that you have it trained and tamed. As an end user, after the Clifford update, WP is setting itself up as becoming an out of control monster. indeed, a larger out of control monster than it’s brother Woocommerce, which has been out of control with it’s upgrades for many, many months. Perhaps it’s time for WP to seriously re-consider it’s “Free” model and introduce a more controlled subscription model. I’m certain that most end users would not mind paying a small monthly or annual subscription fee to ensure a more secure and reliable update system. I believe that the WP community needs to tackle this issue now before this monster really does get out of control. and i believe that WP needs to wake up and smell the professionalism. Anymore of this and i’m certain that another platform without these issues will appear over time and WP may end up as the “Betamax” of the internet. It was a great comment, wasn’t it? And I’m glad that you, as an end-user, opted to comment here, too! It’s good to get input from those who aren’t building but who are using. 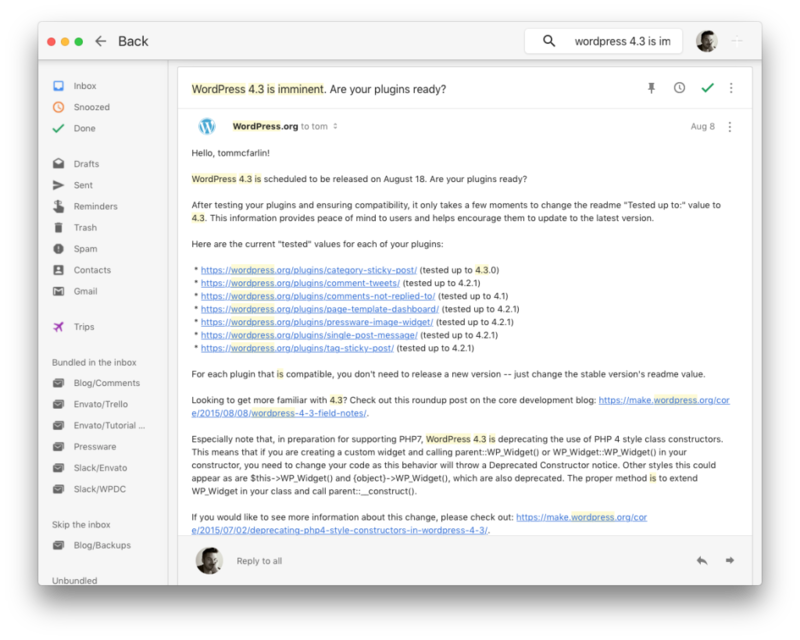 I’m not disagreeing with you, but I did want to offer a slightly different take on this: WordPress is under constant development and it offers the ability for us – as developers – to have constant access to the codebase at any time. Further, there are blog posts that are provided that outline changes and publicly available roadmaps so we aren’t caught off guard. n the authors article, he shows an update imminent notice from WP, giving 10 days notice. After the latest farce which erupted with Clifford release, it’s obvious, even to me, that 10 days not sufficient time for every developer. This insufficient time impacts me as an end user of WP. So, still, in my opinion, it’s still totally WP’s fault. 10 days is definitely not a significant amount of time but, as mentioned above, it’s also not the first and only heads up we’ve received. I’d say that the burden of responsibility of keeping up with the open source platform on which you’re developing is on you (the general developer, not you specifically :). It’s not the core team’s fault that our plugins are incompatible. Right now, it’s the nature of the system. We have plenty of information on hand to prepare us. The email I showed is more-or-less the final warning we have. And I’ll be honest, I have some small plugins that are available in the repository that haven’t been updated for 4.4 but they still work. I just haven’t had the time to update the README to reflect the change. Should I update them? Yes! Have I had the time? No and that’s because of other paying obligations. Is it on my list of TODOs? Absolutely! WordPress is always going to be free (unless something absolutely drastic changes, which I don’t believe will happen), but this idea of having a more managed solution is something that is available from some companies. And some people do pay for it (so I agree with you – people want it, thus the market provides :). I believe that WP needs to wake up and smell the professionalism. The community certainly has it’s share of lackof professionalism, but it’s not as widespread as one might think. There are those of us who care deeply about the software project, the businesses we’re building, and the tools we’re providing. Comments like this help us to know what we can do better so it’s appreciated, for sure. But we do have to be careful in where the focus of frustration is geared. As developers, we have responsibilities to uphold. It’s not fair for us to not uphold them and then to complain about the core software. I’d rather just admit my own faults, take responsibility for them, and move forward from there. Unfortunately, not all are like that, but I’m trying to be as open as possible as a developer talking to an end user. Anything is possible, but I’d place my bets on WordPress continuing to grow in popularity rather than decrease. There are definitely some great publishing platforms that are available today and I won’t deny that. I’ll go as far as to say as WordPress could learn from them and we could incorporate those ideas into it; however, to say that it’s going to be something like ‘Betamax’ is a bit of hyperbole. There might be aspects of it that go away or that need to change, but WordPress as a core piece of software powering so much of the Internet isn’t going to completely go away. Regardless of whose fault it is, the fundamental issue exists – WordPress, themes and plugins are updated regularly and staying up to date is important for obvious reasons. But it creates a burden on developers and site owners because things break. This will probably always be the case given the ridiculous number of permutations of WP versions, themes and plugins. What we really need is better tools to identify when an issue occurs and then fix it, so we can keep moving forward without it being a frequently painful experience. It’s especially painful if you manage 30 sites for clients. Just the time it takes to visually review all of them to make sure the latest update didn’t break anything is incredibly time consuming. Okay, here comes the shameless plug. We built a tool that addresses this by doing a visual compare of your site before and after an update. Big time saver. http://www.wpboom.com. Certainly, greater professionalism and release coordination between WP core, theme and plugin developers would help but I can’t see that ever fixing the problem completely. I really think it about creating better tools to identify, control and manage the process. If I came off as someone who was placing blame, I never meant to do that. I was more or less trying to clarify a point. Nonetheless, you’re right! It’s important and the reasons are quite obvious. But it creates a burden on developers and site owners because things break. This will probably always be the case given the ridiculous number of permutations of WP versions, themes and plugins. Sure, but I also see this as something that’s common in almost any software system. I experienced it in Rails and I experienced in closed-source .NET shops, too. If anything, I’d say this is the nature of development and it’s why things such as unit tests, etc. are so important. They raise awareness as to what’s broken when something changes. It’s just too hard (read: impossible) to keep track of that in your head. There are ways to mitigate this, though (assuming the clients don’t have permissions to update the site themselves). Cool! Shameless plugs are generally welcome :). I think the core team does a pretty good job of letting developers know when something is coming. Not only that, but we have access to a public page of roadmaps and we have access to daily builds via Subversion so we can always be checking our work against it. We don’t have to wait until we get the notifications emails to begin updating our work. That said, having tools to identify and manage change is crucial especially for larger plugins and/or sites. Looks interesting. But I can’t see any Privacy or Terms and Conditions on your site, and wary of using anything that doesn’t show how data is used, or liability for things that might go wrong. Hi Danny, yes, it’s currently in private beta so the landing page is in its infancy. But this is not a plugin, it’s an external SaaS app that only takes screenshots of your site and visually compares them against earlier screenshots to tell you if something has visually changed. So there is no data collection, per se, other than screen shots and URLs – stuff that is readily available to anyone visiting a site. The premise is that visitors don’t care if the underlying code of your site changes, they only care if things don’t look right. Though now that I’ve written that, I realized that perhaps you are talking about email collection? All email collection will remain private and used only to alert people about WP BOOM happenings and of course you can unsubscribe any time you want. But, point taken, we’ll get some Terms written. I agree that this happens in all software development and processes like unit testing are golden when you are working on a distinct code base, like WordPress core, but could you create unit tests that would test for the interaction effects between WordPress, a theme and a plugin? That’s above my pay grade but if someone could create some type of overarching testing framework that all WP core, theme and plugin developers could participate in that would tell them if there was breakage/conflicts between their code and other’s in the ecosystem, that would be REALLY cool. Of course it would still require everyone to participate, which we can predict is unlikely to happen. So, I think we are left with change identification and management tools to help clean up the inevitable breakage. Sure – point taken :). I agree that this happens in all software development and processes like unit testing are golden when you are working on a distinct code base, like WordPress core, but could you create unit tests that would test for the interaction effects between WordPress, a theme and a plugin? Yes and no, but it obviously depends on if you’re the vendor of both the plugin and theme in question. Ideally, if you’re following the WordPress Coding Standards and best practices and using the proper plugins like Theme Check and Log Deprecated Notices, you can get a long way with better code coverage than without. I’m not saying it’s perfect. Far from it. But it’s also a step in the right direction and it’s far more than what a lot of developers are using when creating their work. Of course it would still require everyone to participate, which we can predict is unlikely to happen. I think we’re splitting hairs here. I haven’t heard anyone say that WordPress broke their site per se. However updating WordPress CAN break your site and there’s no avoiding that. As WordPress professionals, we’d love everyone’s websites to use good quality themes and plugins that meet the latest standards and have future-compatibility. However this isn’t always the case and updating WordPress can be the trigger to a broken website – albeit not the culprit – if the theme or a plugin is no longer supported, or if you have a custom theme or child theme that will require some redevelopment work to bring it in line with the new version of WordPress. With many hosting companies automatically installing major WordPress updates, this can mean that updating WordPress breaks your site – often unexpectedly, if you didn’t know the update was coming. And it can be a big job to get it working again if your theme and plugins were particularly problematic or bespoke. This leads to the sad situation where a lot of people choose to stay on an old version of WordPress – if their host allows this – and the security risks this brings. I’d love to see everyone on the latest version WordPress, but pointing out that it’s not WordPress’ fault doesn’t help with the fact that the update can still break your site, often in a way that’s not easy to fix. Rather than playing the blame game, the best option is to have your updates handled professionally to ensure they are done in a safe and planned way. Small fixes (e.g. replacing a plugin which is no longer supported or ensuring that everything is updated at the same time) can be done as part of the plan, and more significant fixes can be done in a planned way without affecting your live site. There are many specialist WordPress support companies out there who will do updates for surprisingly real prices, and most web agencies offer this service for the websites they have developed. I genuinely do how you can see where it looks like we’re splitting hairs, but that’s not at all the point of the post and I don’t think it’s the case. This is as a respectful disagreement to be sure. If you’re running WordPress core and using the out of the box theme without any plugins, the likelihood that a WordPress upgrade is going to break your site is slim-to-none. But when you start introducing other themes and other plugins that don’t do a good job of staying up to date with coding standards, practices, APIs, and so on, then the odds of it breaking drastically increase. But it’s not WordPress that’s breaking the site. It’s the incompatible software running on top of it. As WordPress professionals, we’d love everyone’s websites to use good quality themes and plugins that meet the latest standards and have future-compatibility. The major hosting companies who are offering a lot of these types of services often – at least in my opinion – cause a lot of harm. This opens a discussion about the “should we allow automatic upgrades or not?” and it’s worth talking about, but in another post, I think :). Anyway, when these services do these things, I do agree that it causes problems. The challenge then is educating people on what the dangers of this and it’s near impossible to do that especially because those companies are so much bigger and they make it so easy for someone to get up and running with little to no guidance. In some ways, sure, that’s good. In others, we find ourselves like the situation in which we’re discussing. Spot on with this. Not only that, but eventually the software that people want to use aren’t going to be compatible with their old version of WordPress so they are left with so many things that just aren’t going to work and cause who-knows-what to happen with their installation. I’d love to see everyone on the latest version WordPress, but pointing out that it’s not WordPress’ fault doesn’t help with the fact that the update can still break your site, often in a way that’s not easy to fix. Completely fair point. To be clear, though – and I should’ve done this in the post – it wasn’t about trying to point this out and not offer a solution. It was an implication that all people who are able should do a better job vetting the tools they are using with their installation. And if you’re not sure, ask your local or resident or well-known or whatever WordPress professional for help. Again, far easier said than done, but something that I think we can start doing if for no other reason than to try to turn the tide from the direction it’s flowing. There are many specialist WordPress support companies out there who will do updates for surprisingly real prices, and most web agencies offer this service for the websites they have developed. Indeed! And I’ve got a post scheduled to go out in the next couple of weeks exactly about this. I’m likely to go back and update it to reference this comment thread because you’ve done a great job of raising some good points that I’m glad to see. Thanks for your reply. In many ways, the real issue is that many people see a new website as something that is worth investing in, but aren’t prepare to invest in maintaining their website on an ongoing basis – even complex sites that are more likely to break after an update. This leads them to either neglect their site or do their own updates, and then they get upset when something breaks. I think WordPress is seen as being so accessible that people think they can manage their own websites, which is fine for a simple site running WordPress core and an out of the box theme with no plugins as you say, but not for everyone. WordPress can be used to create literally any type of website, and different types of website have different maintenance needs. I’ve been updating an old WordPress 2.3 site a few weeks ago and it worked like a charm. It wasn’t even that big of a surprise that WordPress managed to alter the old database to fit the newest structure so seamlessly. Fortunately there were no plugins that needed to be taken along, they were all deactivated. Most of them do not even exist anymore! Like you pointed out accurately, it’s very often just about the plugins and theme – and those old ones would have definitely caused problems! Of course, the theme was also not reusable..
I’ve been updating an old WordPress 2.3 site a few weeks ago and it worked like a charm. It wasn’t even that big of a surprise that WordPress managed to alter the old database to fit the newest structure so seamlessly. It’s awesome, isn’t it? This is why the application’s commitment to backwards compatibility matters so much. People are still using old versions and upgrades will and should happen. And they shouldn’t cause major problems. Of course, the theme was also not reusable..
Yeah, it’s bound to happen. This is why I’m in favor of paid products more so than the free ones, but that’s probably a discussion for another place than the comments ;). Yes, really, really old if you consider it’s 2016 already. But fortunately the site wasn’t publicly accessible – I think that would have been a horribe security risk.. Surely there could be a lot to discuss on that topic! Let me just say though it might be more reliable in general, there never ever is any guarantee the developer isn’t going to drop a theme or plugin for whatever reasons. Next PostNext Should I Use Caching on a Shared Web Host?